Home » Geen categorie » VAT-refunding in the EU: Why making easy matters difficult? In my previous blog I wrote about the possibility for all EU transport companies to reclaim their diesel duties paid in Belgium, Hungary, France, Italy, Slovenia and Spain. This blog focuses on refunding of the VAT paid in EU-countries. By now you are likely to do so, so you will be familiar with the complexity of this process. If still you are not reclaiming VAT, maybe just because of this complexity, then use our online btw-calculator (online VAT calculator) to find out how much VAT you could reclaim. The complexity of the reclaiming process forces many companies to contract it out against a fee. In this blog, I will propose several reasons for recommending you to do so, including a few reasons why you should choose an international service provider for contracting out this process instead of employing a local accountant for instance. Why to contract out your VAT reclaiming process? And to what party? A separate application for each individual country. In spite of the possibility provided by a (special site portal of) the Dutch tax department for reclaiming your VAT paid in other EU-countries, you must submit a separate application for each individual country. VAT amounts that qualify for refunding vary per country. In some EU-countries for instance it is impossible to reclaim certain amounts, like restaurant or fuel expenses, whereas in other countries you can. Although you might not meet the threshold value set on quarterly reclaims, you do not wish to wait a full year before reclaiming your VAT. If you prefer to reclaim foreign VAT every three months, you must attain a certain threshold value. If you don’t, you can only reclaim the VAT on your foreign purchases on an annual basis. If as a haulage firm you operate in many different countries, the total VAT amount that qualifies for refunding may grow considerably. As some providers, like DKV, provide an ‘instant refunding system’ that even enables you biweekly VAT refunds, haulage firms often choose to commission this process out to a third party. The process is time-consuming and therefore costs. This may well be the main reason by far. The process involved in reclaiming VAT from EU-countries takes (a lot of) time. You are expected to collect your bills, verify each of them on its legal validity and then upload it into a system, often by hand. In short, contracting out VAT-refunding processes for other EU-countries may help you make your business operations more efficient. You will resume control. Next, the question will arise of what party to entrust this process to. I would advocate to choose a company that has international offices that know about your industry. Why? Because internationally operating companies employ local experts who are familiar with the exact regulations prescribed by their own countries. They are in contact with the local tax departments, which generally results in better acceptance and fewer questions being asked. This specific knowledge of the branch is important, since rules in the transport industry are highly complex, which requires specific branch expertise. Consider for instance the differences between freight and passenger traffic. In my function as refunds expert I have been working together with both large and small businesses for many years to reclaim VAT paid in other EU-countries. We do this not only for VAT-amounts paid via DKV, we do this for all your VAT-amounts. 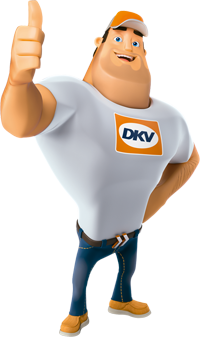 So even if you do not use DKV fuel cards, we could be of service to you. We offer two procedures in this respect. There is DKV REFUND NORMAL, in which we verify if VAT-amounts qualify for refunding, and, if they do, reclaim them from the tax department of each corresponding country. Then there is the DKV REFUND NET INVOICE procedure, in which all your foreign VAT-amounts are instantly credited to your biweekly DKV invoice as soon as your receipts have arrived with us. This is a fully automated process that allows you 24/7 access to all your records and the status of your applications via DKV eREPORTING. This procedure keeps you updated constantly on the current status of your affairs. Next Btw-restitutie in de EU: Waarom moeilijk doen als het makkelijk kan?